A new menu at the baseball stadium in Arlington sounds like the Texas Rangers have a crush on the State Fair of Texas. Delaware North Sportservice, the food and beverage purveyor at Globe Life Park in Arlington, has added new menu items for the Major League Baseball postseason that seem more kitschy than edible. Elvis Jabberdog Brownie. Two-foot-long brownie is rolled in a Rice Krispy crust, dipped in funnel cake batter, fried, and topped with whipped cream. There is also a half-size Elvis Jabberdog Brownie Jr.
Sweet Spot Cotton Candy Dog. 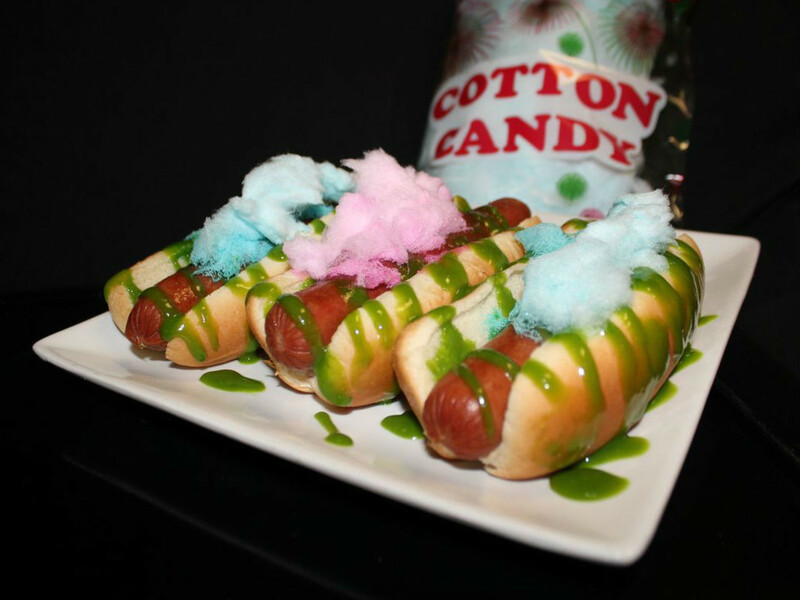 All-beef hot dog with cotton candy-infused mustard is topped with cotton candy. They say that the flavor profile is "both sweet and salty," but they leave out the key word, which is "icky." One-Pound Top-N-Go Cheetos. One-pound bag of Cheetos opened on its side and loaded with choice of chili, taco meat, shredded chicken, or brisket, then topped with nacho cheese and optional jalapeño peppers. Like a spinoff of Frito Pie, but with Cheetos instead. Choice of toppings vary by location. Inside-out Hot Dog. One-pound hot dog is 8 inches long and 2 3/4 inches around, and it is designed to be eaten with a fork and knife. The inside is cut open and filled with choice of mac and cheese or mashed potatoes, then topped with brisket, chili, or shredded chicken. Served with a pretzel roll. These treats join a slate of questionable offerings that include bacon on a stick and fried s'mores.